Already, we have seen Israeli PM Benjamin ‘Bibi’ Netanyahu threaten Russian President Vladimir Putin regarding Iran’s military presence in Syria, warning that ‘Israel may act to curb Iran’s clout in Syria.’ Naturally, this new facility will be viewed by regional stakeholders as a counter weight to the new Syrian situation. The US base may also be used to launch air sorties to defend Israel’s recent illegal annexation of the part of the Golan Heights, land which it has managed to take under the cover of the Syrian conflict. Recently, Israel has managed to pry away this contested land from Syria with the help of Al Nusra terrorists on the ground, after they previously chased out UNDOF Peacekeepers which had been positioned there since 1974. Amazingly, the UN still has not updated its website to express this new reality on the ground (still showing a mission photo from 2012). Earlier reports clearly show how Tel Aviv has been providing material assistance to Al Nusra terrorist fighters – a policy which Israel has not apologised for. Whether that’s perceived as a positive message, or a message of US imperial expansion remains to be seen, but by most accounts, it’s likely to be the latter. 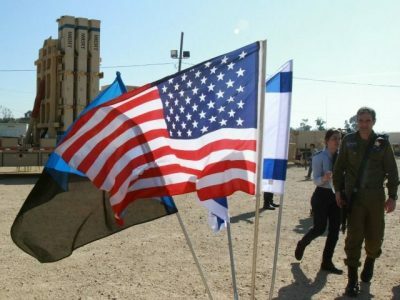 If anything, the establishment of a US base in occupied Palestine could help to reinvigorate the international pro-Palestinian activist movement, which traditionally has had an anti-Imperialist message in its mission. Generally speaking, it’s hard to see how such a move by the US can be seen as a positive development for the region. Add to this other direct provocations by the US on behalf of Israel, and we have a recipe for potential disaster down the road. Earlier in his term, Trump also announced his desire to relocate the US Embassy from Tel Aviv to Jerusalem – seen by many as an aggressive move by Washington, which would be viewed as an affront to a long-established policy respecting the political and religious neutrality of Jerusalem. Note that the Jerusalem Embassy Act was passed into law in 1995, although successive US presidents have opted out of such a move in the interests of maintaining peace over this contentious issue. For decades, cohorts of US forces and technical advisors have been based in Israel, running joint exercises with the IDF, and also installing and operating military projects like the famous Iron Dome missile defense array (also run out of Stuttgart, Germany) which went online in 2011. It seems that this latest deployment is not only about defense, but about projecting power in the region – with neighbors Syria and Lebanon in its immediate sights. The new project will feature a new long-range missile system, the Arrow 3, delivered by the US to Israel in January (image, left), and the medium-range “David’s Sling” missile system, and an expansion of the short-range Iron Dome missile defense system. The nearby town of Dimona is also home to Israel’s notorious nuclear reactor, and its unaccounted for nuclear warhead arsenal. Aside from being Israel’s alleged ‘nuclear deterrent’, many also regard Dimona as a nuclear liability, and a giant ‘dirty bomb‘ contamination risk to the region. Now Israel has a US base on its soil – another perfect Casus Belli, or target. It goes without saying that if anyone so much as grazes this sacred facility, or even threatens to do anything to it, this will undoubtedly be used by the US to step-up ‘security operations’ in the region and further inflaming an already tense situation in the Middle East. All by design, of course.